microKORG, Analog Modeling Synth from Korg in the micro series. 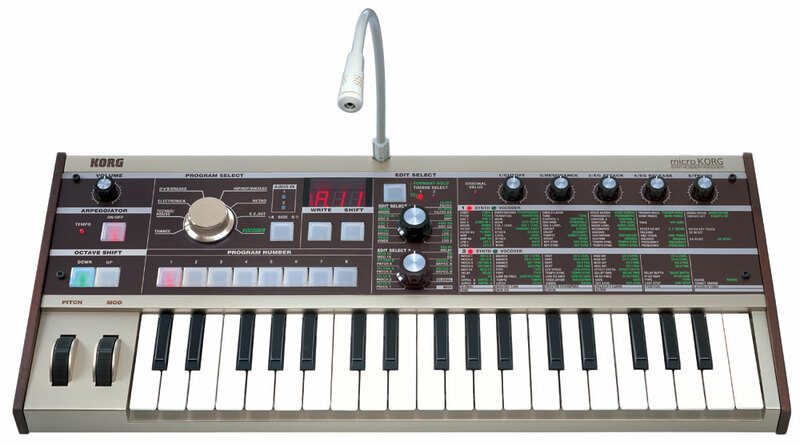 The MicroKorg is an analog synth with a built on microphone and 8 band vocoder. I have had the MicroKorg since 2007 and I still use it a lot. There are 128 programs with a total of 4 voices. It is very portable because it is light and small plus very durable. I have been taking this keyboard around in just a book bag for a while now and it never as even got a scratch on it, it looks brand new! Using it is simple, but could require some reading in the manual if you have not worked with an analog vocoder before. 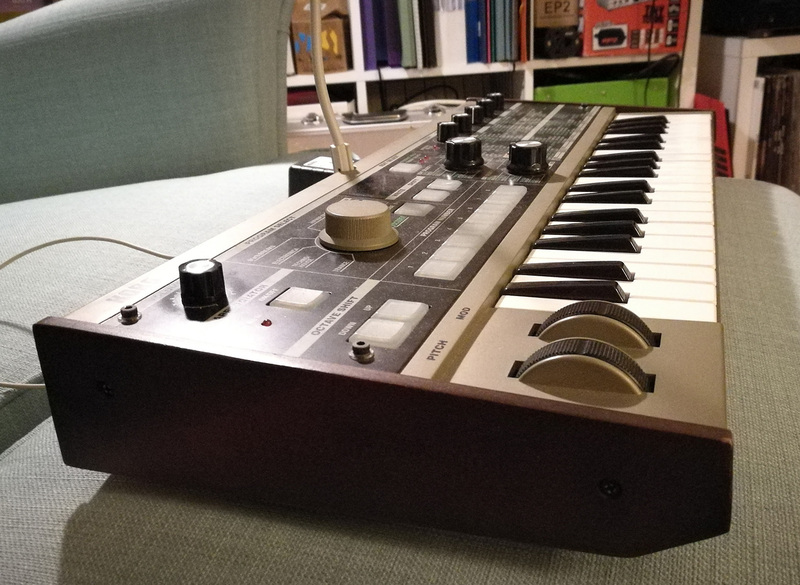 Even if you have worked with a digital vocoder you will be in for a change with this MicroKorg. You can run this on 6 AA batteries or you can use the standard wall supply for power that comes with it (9 V). It weighs less than 5 pounds which is unreal to me that I was able to take this with me almost everywhere and do some really cool stuff. There are also 3 delays effects, 3 modulation effects and 6 arpeggiator effects. There is no USB connectivity with this synth but it has 128 presets to work with. No on board sequencer and no audio playback so all of your sounds will have to be running out of the outputs to your speakers or your interface for tracking it into your computer. It does however have MIDI in, MIDI out and MIDI thru though. It comes with a condenser microphone that is attached to it. Also, I noticed that when I use to travel with it; it would eat through those double A batteries pretty fast and I always found myself having to go out and purchase more batteries all of the time. This was not a big issue just frustrating because they would die so fast. Alright, I bought this because every single other band was using this keyboard. If you need to channel a rocket ship at the beginning of a song or track a hypnotic melody line over top of a pop song this keyboard will do it. Where else would you buy such a trendy piece of gear? Guitar Center. I waited in line behind all the gel'd hair dudes in wearing chick jeans before dropping close to $400 on my the counter to take this home. It is a no directions needed plug n play keyboard. Pitch bends and tone wheel is super cool. In a matter of minutes anyone is a musician on this. OK this review sounds jaded. It does give you plenty of cool sounds at your fingertips and can easily fit in a backpack and be brought to the gig. Korg is known for making quality, durable keys. The keys are very tiny. I am a bass player and have fat, calloused fingers. It is easy to get tripped up on this keyboard. I have scene these get dropped, stepped on and even a beer or two spilled on these. They are like the Timex watches of keyboards. If it's strong enough for a rock club it will last anywhere! A great non-keyboard player's keyboard! Need to thicken up your band's sound? This synth will do it. This is a digital synth that has three octaves. There are connections for a microphone (input) as well as a 1/4" output for amplifiers and PAs. There's also an XLR out. 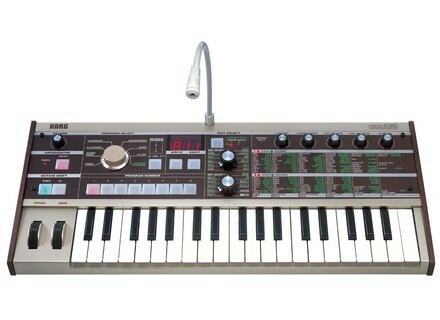 The Microkorg has a built-in vocoder which is the reason for the microphone. There are wheels to adjust pitch, modulation, and sustain. It can be used for monophonic or polyphonic purposes. The sounds on this machine are finite, meaning you cannot update them with a computer. Using this machine is pretty simple overall. While there are a bunch of sounds, there isn't an astronomical number of them, meaning you can get around them pretty easily and program your favorite ones for easy access. THe hardest thing about using this keyboard is the size of the keys. These keys would be relatively small for any player who isn't a child, and my hands happen to be quite large, so I sometimes struggle to fit the notes in. However, I think this is a relatively small problem considering that my main use of this synth is for single note lines, though. The manual is really good at explaining how to work the synth, and it definitely made things easier once I got started. I love the sounds that come out of this synth. Don't let the size fool you; this guy really brings it! My favorite sounds are ones that can best be described as throwbacks to 80s new wave and 90s dance music. I think that if this is what you are looking for, these sounds are great. It also does a decent job of emulating mellotron and organ sounds, which I wasn't expecting. I wouldn't buy it specifically for those things, but they are a nice bonus. To top it all off, the Vocoder is undoubtedly one of the best features of this synth, and almost worth it for this alone. The sounds are only as realistic as a synth can be. It emulates synth sounds, not the sounds of real instruments, so I'd say they are overall pretty realistic. There isn't much in the way of touch sensitivity, but the sounds that come out of this guy aren't really the kind you'd need a whole lot of sensitivity on anyway. I like some of the effects, particularly the modulation and reverb effects. I haven't had a single complaint with any of the sounds that have come out of this synth. This synth came highly recommended by a few friends of mine. They didn't steer me wrong. I am very happy with this purchase. I like the diversity of synth sounds, the vocoder, and the relatively compact size of this keyboard. It's a bit pricey but I am very much convinced that it's worth it. I think that the sound quality is solid throughout, and assuming you use the right amp or DI this thing can work wonders. If broken, I would certainly replace it. The Korg MicroKorg is a three octave synth with a huge variety of uses. It has pitch and modulation wheels, as well as a built in vocoder and a 1/4 inch output to send the signal to your amp. The synth has all different types of lead synth sounds, pads, and just about every synth sound under the sun. It can be monophonic or polyphonic and also has a 1/4 inch output for a sustain pedal. Using the Korg MicroKorg definitely takes a bit of practice and getting used to as it has so many different types of sounds and an incredible amount of parameters to control these sounds. You can use their presets, alter them, or create your own. The manual for this is complete and clear and is worth having around when you are learning this synth, as you never know when you might need it. 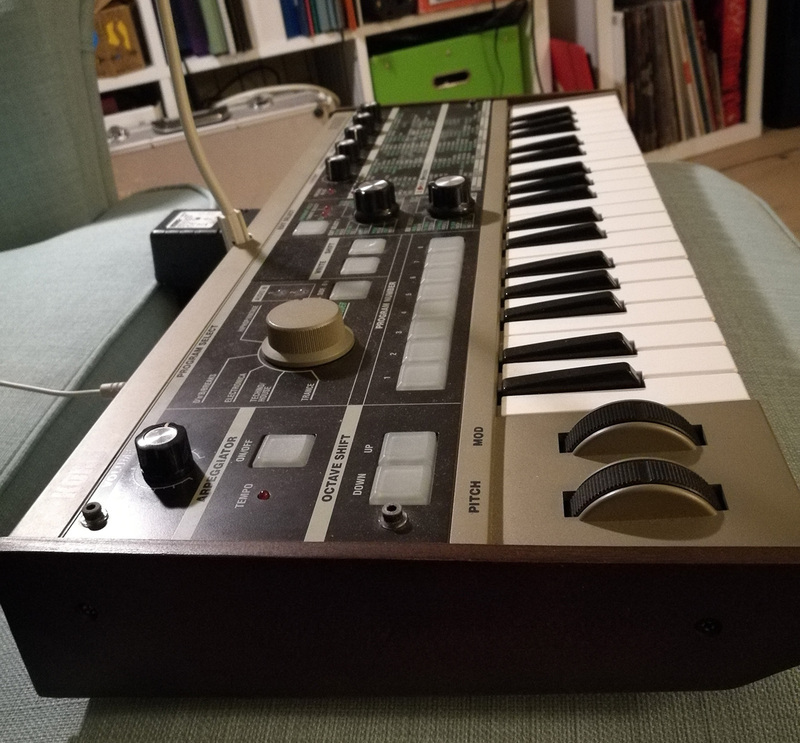 The Korg MicroKorg has enough different synth sounds to cover just about any genre, but I use it mostly for pop music. The synth sounds are realistic and extremely varied. The vocoder is awesome and almost worth the price of this alone. I also love the arpeggiator as it makes for some truly awesome sounds. The touch of the keys is accurate, but I really wish that it had full keys, as it can be hard to play with such small keys. Since it has such small keys, it is really suited best for playing single hand lead synth lines. I've been using the Korg MicroKorg for about three years and I have found it to be a great overall synthesizer for getting really synth like sounds. The price is reasonable for such a versatile unit, and it has become quite a popular synth as I've seen it used all over the place. Its great in the studio, or in a live setting as it has a wide variety of sounds and effects. If the keys were normal size, this synth would be a knockout, but the small keys can make it somewhat hard to play if you are not used to it. 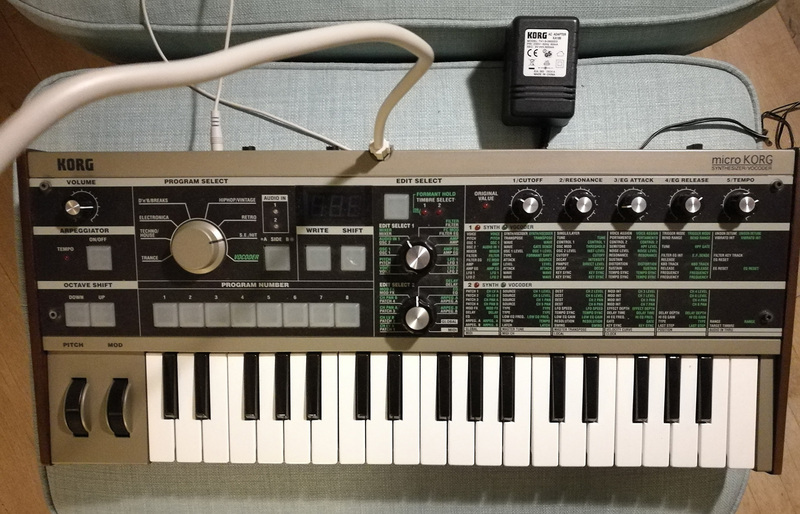 The MicroKorg is worth a look for any keyboard player looking for a cheap way to get great synth sounds. 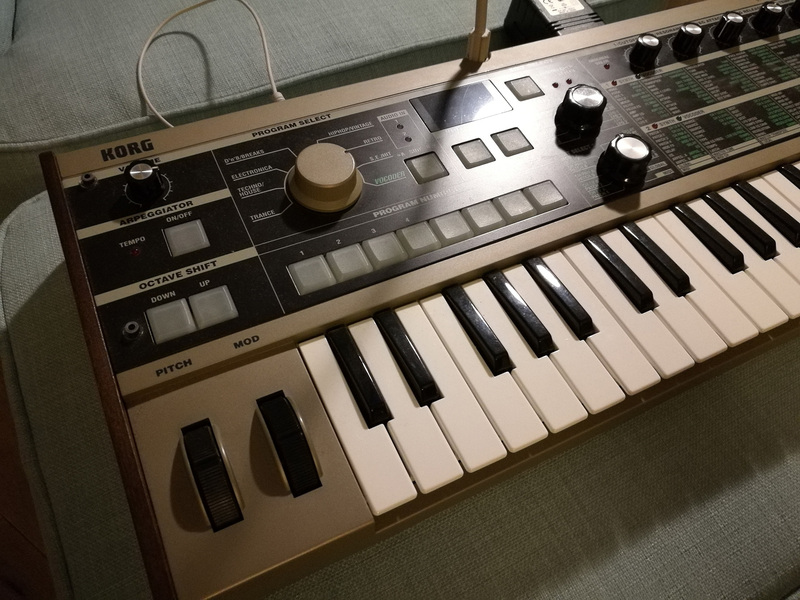 Korg recently announced a new version of the microKorg synth with a golden panel, the instrument is now available worldwide.